Make no mistake, Odd Future Wolf Gang Kill Them All (often shortened to OFWGKTA) are the pioneers of a creative new breed of hip-hop. A collective of 11 rappers, producers, artists, and yes, skateboarders, Odd Future includes lead rapper and producer Tyler The Creator, rappers Hodgy Beats, Earl Sweatshirt, and Domo Genesis, singer Frank Ocean (who can be heard on Kanye and Jay-Z collaboration Watch the Throne), producers Left Brain, Syd the Kid, and Matt Martians, not to mention a host of other non-musical members. It gets even deeper. 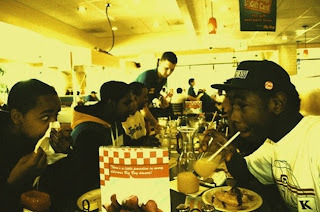 Within the collective are various groups such as MellowHype (composed of Hodgy Beats and Left Brain), The Jet Age of Tomorrow (Matt Martians and Hal Williams), and EarlWolf (Tyler, The Creator and Earl Sweatshirt). What's even more impressive is that a number of Odd Future's members never even experienced the '80s. Both Tyler, The Creator and Hodgy Beats are 20 years old and Earl Sweatshirt is 17. So with all the talent pouring out of this collaboration, it's not surprising that Adult Swim has announced that beginning in 2012 it will debut Odd Future's live-action TV show "Loiter Squad." The show has been described as an intersection of "Chappelle's Show" and "Jackass," so you can expect some shenanigans. Below, you can check out Nardwuar's interview with OFWGKTA at this year's SXSW festival.